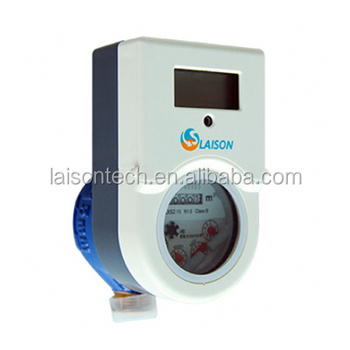 LXSZ Series Prepayment Multi Jet Water Meter, which complies with OIML R49, ISO4064 etc international standards, is a type of intelligent water meter with prepayment, anti-tamper, overdraft & billing functions, etc. LXSZ (MC Series) Step-tariff Prepayment Smart Card Water Meter additionally supports real-time clock, step tariff, real-time monetary calculation, monthly data frozen to provide real-time accurate water consumption statistics, meanwhile has friendly time period management function to ensure the water use in holidays and duty-off time periods as human-based management of water supply. By application of Laison Prepayment Information System (LAPIS) and LXSZ Prepayment Water Meter, it provides comprehensive, reliable, advanced smart prepayment solutions to the water utilities & authorities. RTC with temperature compensation, the accuracy error is <0.432s/day. 5 Levels stepped tariff according to the monthly consumption. The steeped price could be set in the system and transfer to the meter by HHU or tools card. During Non- Switch time, the meter valve will automatically connected before friendly times reach the maximum value, neither the meter has credit balance or not. Maximum 100 holidays can be set into the meter through the tool cards. It divides into Monthly frozen data or daily frozen data. The time could be set to either day in the month, default configuration in 15th, and the daily frozen time set to 0'clock. Frozen data could be transferred to the meter through user card or check card.